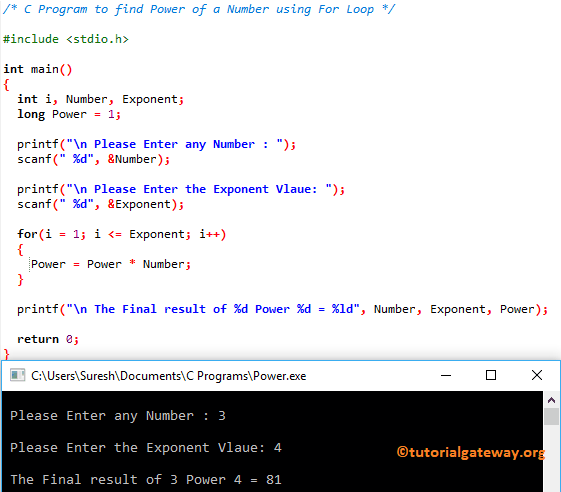 In this article, we will show you, How to write a C Program to find Power of a Number using For Loop, and While Loop. You can also use pow function to achieve the same. This C program for power of a number allows the user to enter Number and an exponent value. Using these values, this program will calculate the Power of a given number using For Loop. Within this C Program to find Power of a Number example, We initialized the integer i value to 1 and also (i <= Number) condition will help the loop to terminate when the condition fails. It means condition inside the For loop (5 <= 4) is False. So, compiler will come out of the For Loop and prints the output. This C program to find power of a number allows the user to enter an integer value and the exponent value. Using these value, this C program will calculate the power using While Loop.